I recently put down our 19 year old cat. It was terribly hard. Even though I know it was the right thing to do, I will feel guilty about it forever. Her name was Bella, but she had many nicknames. Bella Wella, Pretty Girl, Little Girl, Girlie Girl, Little Punkin, Little Bit of Nothing, Little Miss Sunshine, Sun Bear, and Iddle Biddle Diddle. 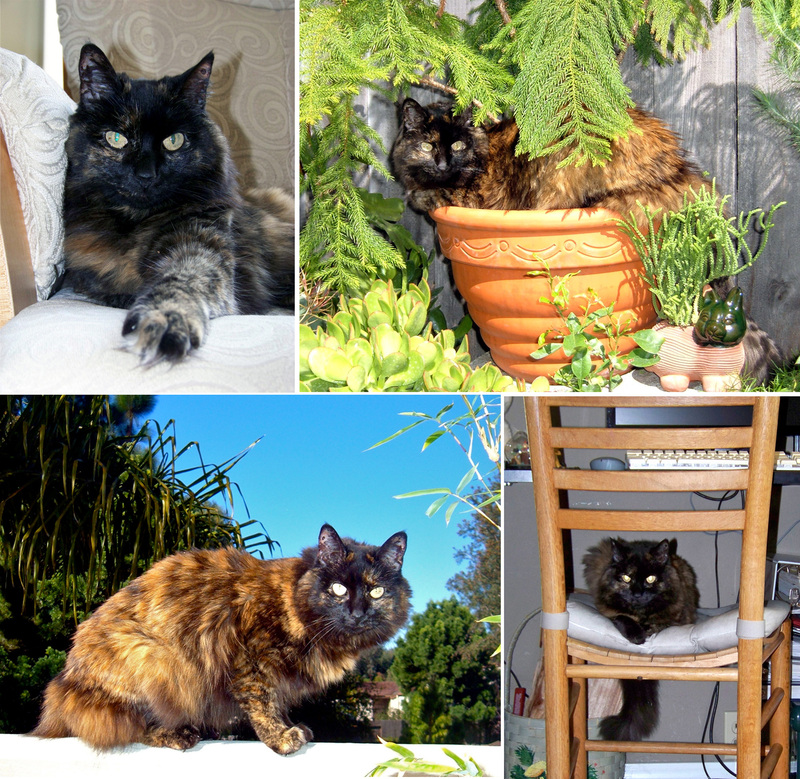 She was a medium length hair tortie who had the softest fur in the world. She had orange stripes hidden on the inside of her front legs, mottled skin on the inside of her ears that reflected the patchwork of fur colors on the outside, tufts of fur that stuck out between the pads of her paws, puffy back leg fur that looked like pantaloons, and a small patch of creamy white on her chest (hence Sun Bear). I loved to bury my nose in her side and sniff her, because she had a nutty, earthy smell. Not all cats smell the same. Julius smells like an old closet. I don’t like to sniff him so much. She was always tiny. At her heaviest she weighed about 8 pounds. For most of her life she weighed about 5 or 6 pounds. Towards the end of her life she was 3 to 4 pounds. I held her over my shoulder and carried her cradled in my arms a lot the last few months of her life. When she was young I would drape her around my neck like a scarf. But she was not a cuddly cat. When I chose her from the litter, I should have been tipped off when she wouldn’t stay in my hand for more than a few seconds. She would let me hold for a short time, but then would jump away. She would cuddle in bed at night for 5 or ten minutes, and then jump away. 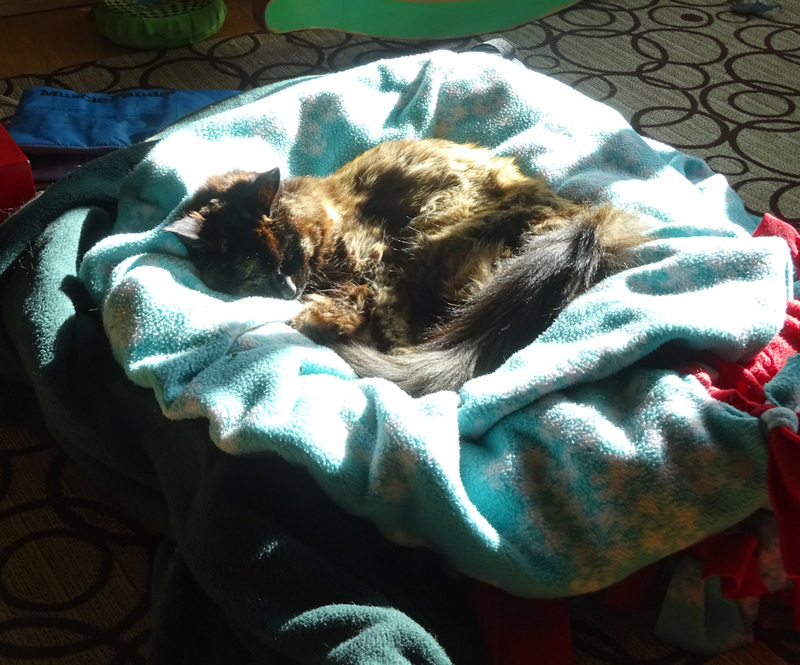 She was a quirky, freaky little cat, like a lot of torties. Bella was a bionic jumper. I found her on top of an open door once. Perched up there. Actually, she was kind of stuck. When we moved into our current house she would jump to the top of an 8 foot tall fence to get into the neighbor’s yard. I had to fish her out of there a couple of times, thank goodness they were friendly people. Bella was fiesty. She lived with big, grey Enzo for 10 years, big, grey Jacque for 2 years, and big, grey and white Julius for 8 years. Julius weighs 15 pounds. She was less than a third of his size. When he started messing with her she would take it for awhile, but if he pushed too hard she would start in on him, and I would come into the room to find him rolled over on his back crying while she dove in to nip him again and again. When she was very small Enzo used to lick and clean her until she was damp, and then he would start to chew on her. She learned early not to take any guff from big, grey cats. She was also stubborn, obtuse and sometimes not terribly bright. Enzo and Julius were/are my smart cats. Jacque not so much, evidenced by his running off one night and never making it back. Bella would jump on the counter, I would take her down, she would jump up, I would take her down. Rinse and repeat. When Lisa and Tom were watching her when she was kitten she got her head stuck in a tissue box. When Mel was watching her she freaked out each and every time she walked past a mirror wall in their house, because she saw the stranger cat in it. As she got older her stubborn streak became a mile wide. She got wet food whenever the hell she wanted it, because she would NOT STOP meowing for it. She never learned the word “No”, which is something smart cats do. Or maybe she was the really smart cat, and she knew what “No” meant, but just chose to ignore it. Until the last few years of her life, she had a huge purr. It was incongruous, coming from such a little body. Even the tips of her whiskers rumbled when she purred. But like most things that made Bella Bella, her purr became almost silent. She, who could leap several times the length of her body straight up into the air, couldn’t jump up onto a chair or climb the stairs. She became deaf. She had cataracts and couldn’t see well. Her right hip was painful and caused her to limp. She faded. My eyes are tearing as I write this, because when you live with a pet for 19 years, when you know every little detail about their body and spirit, watching their decline and making the decision to end their life is gut wrenching. 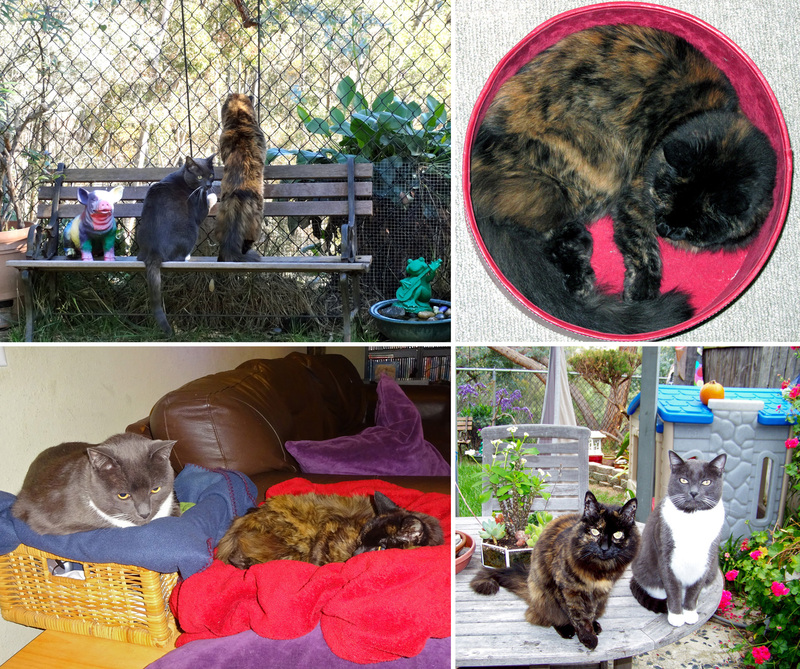 So I tell myself she had a wonderful life, a wonderful family, a wonderful trio of big, grey cats. We had her cremated, and she is in a little box, on top of a slightly larger box that holds Enzo. Over the summer we will go to the shelter and look for another little female cat to bring into our home and lives and hearts. But I miss her. My little Bella. The top left is Bella when she was a few weeks old. She is licking her paw. She wasn’t the prettiest kitten, she looked more like a scraggly bat. Enzo would groom her and sleep with her. He is gnawing on her on the bottom right. Me with my two besties in the middle. Bella isn’t the only one who got old! A close up of her glorious fur coat, all beautiful earth tones. She was kind of freaky, especially when she was younger. You get a sense of that from her wild eyes in the picture on the right. Bella mellowed some with age. We moved into our current house, and we all enjoyed our expanded indoor and outdoor space. She loved to sit in pots. I guess that made her a pot bella cat. She remained beautiful and healthy, though a lot slower, up until the last year or so. She went in the yard every day, to sniff the air and sit in the sun. She slept a lot, and she and I both got creative finding new places for her to nap. Bella on her last morning. I made a nest for her on the floor downstairs, and during the last week she spent a lot of time curled up in it resting. Goodbye Miss Bella, you were a good girl.